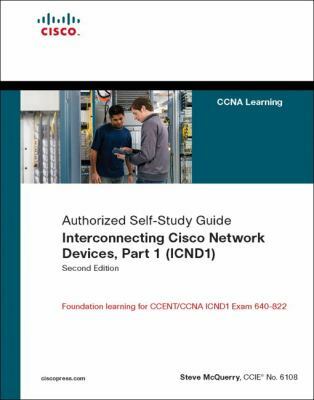 Interconnecting Cisco Network Devices, Part 1 (ICND1), Second Edition, is a Cisco -authorized, self-paced learning tool for CCENT and CCNA foundation learning. This book provides you with the knowledge needed to configure Cisco switches and routers to operate in corporate internetworks. By reading this book, you will gain a thorough understanding of concepts and configuration procedures required to build a multiswitch, multirouter, and multigroup internetwork that uses LAN and WAN interfaces for the most commonly used routing and routed protocols. In Interconnecting Cisco Network Devices, Part 1 (ICND1), you will study installation and configuration information that network administrators need to install and configure Cisco products. Specific topics include building a simple network, Ethernet LANs, wireless LANs (WLANs), LAN and WAN connections, and network management. Chapter-ending review questions illustrate and help solidify the concepts presented in the book. Whether you are preparing for CCENT or CCNA certification or simply want to gain a better understanding of how to build small Cisco networks, you will benefit from the foundation information presented in this book. Interconnecting Cisco Network Devices, Part 1 (ICND1), is part of a recommended learning path from Cisco that includes simulation and hands-on training from authorized Cisco Learning Partners and self-study products from Cisco Press. To find out more about instructor-led training, e-learning, and hands-on instruction offered by authorized Cisco Learning Partners worldwide, please visit www.cisco.com/go/authorizedtraining. Steve McQuerry, CCIE No. 6108, is a consulting systems engineer with Cisco. He focuses on data center architecture. Steve works with enterprise customers in the Midwestern United States to help them plan their data center architectures. Steve has been an active member of the internetworking community since 1991 and has held multiple certifications from Novell, Microsoft, and Cisco. Prior to joining Cisco, Steve worked as an independent contractor with Global Knowledge where he taught and developed coursework around Cisco technologies and certifications. Understand the principles on which basic networks operate Explore the operation and configuration of LANs Extend the boundaries of the network by implementing and securing wireless connectivity Configure routers to provide connectivity between different networks Learn about IP addressing number conversion Establish WAN interconnectivity using point-to-point links, DSL, and cable services Configure Network Address Translation (NAT) Use Cisco IOS commands to determine the layout of a Cisco network topology Manage the router startup and work with IOS configuration files and Cisco IOS images This volume is in the Certification Self-Study Series offered by Cisco Press . Books in this series provide officially developed self-study solutions to help networking professionals understand technology implementations and prepare for the Cisco Career Certifications examinations. Category: Cisco Press Cisco Certification Covers: ICND1 Exam 640-822McQuerry, Steve is the author of 'Interconnecting Cisco Network Devices, Part 1 (ICND1)', published 2008 under ISBN 9781587054624 and ISBN 1587054620.